Marble requires regular maintenance to look its best. Without the proper upkeep, marble flooring will become dingy and yellowed. 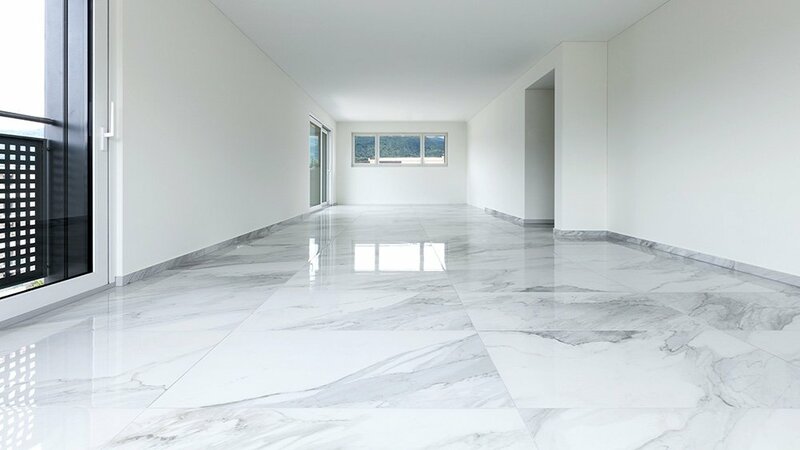 Business owners and homeowners who want to maintain their marble flooring need the proper tools. Here's what you need to know. Natural marble needs to be cleaned on a regular basis. The more often, the better. Failure to clean increases the cost of maintaining the tile. Dry mop on a daily basis to keep dirt and grit off the floor. This prevents scratches and keeps the marble shiny. Use a dry microfiber mop to clean your floors from one end of the room to the other. Avoid using scratchy stiff brooms; soft mops are best. Because it's so soft and porous, marble absorbs liquids quickly. Clean spills as soon as they occur — especially dark liquids, like coffee and wine. Keep absorbent towels on hand for this purpose. If your stone does stain over time, use a poultice to absorb the color. Buy the poultice from a marble repair or restoration professional. Spread the product over the stain and leave it there for the length of time recommended by the manufacturer. Cover the poultice with plastic to prevent it from drying out. When finished, wipe it up. Marble sealer enhances water resistance and prevents the stone from absorbing liquids quickly. This gives you time to clean up spills before the stone can absorb the liquid. Marble sealer is available for sale from stone product manufacturers. Apply sealer yourself or contact a stone restoration professional to do it for you. Most sealers are easy to apply. Wipe the sealer on with a soft cloth, then buff the stone dry with a fresh cloth. Read the directions before getting started; some sealers may require you to leave the tile alone to give it time to cure. These best practices will extend the life of your marble and help keep maintenance costs low. Avoid placing metal objects on marble for lengthy periods of time. Metal scratches marble easily. Rusty metal will also stain your marble orange or brown. Attach felt protectors underneath metal pieces of furniture to prevent scratches. Do not put metal objects into contact with marble in moist environments. Limit marble's exposure to moisture. Some types of marble naturally contain iron, which will rust when exposed to water. This is a common reason that some marble turns yellow. If your marble does turn yellow, contact a marble restoration professional for help. Vacuuming can easily scratch your marble floor. Avoid all use of vacuums to protect your floors. Acidic cleansers (including natural products like vinegar or lemon juice) will etch your marble floors. When etching occurs, the shiny, polished surface is worn away and the soft, duller stone underneath is revealed. Etching greatly increases the chances of stains, and can also cause your marble floors to wear down. When choosing cleaners for your floors, select cleansers that are specifically designated for marble. These products should have a neutral pH, to prevent etching. Avoid making your own homemade cleanser, unless directed to do so by a marble restoration professional that you trust. Place rugs just inside exterior doors. Rugs will stop you from tracking in dirt, thus preventing grit-related scratches. Rugs also remove mud from the bottoms of shoes, to prevent stains. There are few shortcuts when caring for natural marble. Avoid using products that promise a fast return or miraculous results. Old marble that has been damaged may need to be restored by a professional. Watch out for quick fixes that sound too good to be true. Natural stone changes as it ages. The tile may start to wear away, the shine may get dull. A good marble restoration professional will be able to help you with these problems. At Marble Doctor, we use gentle techniques to care for your marble. To schedule an appointment, contact us today.